As part of the collaboration between fig-2, and the Art Fund, the fourth Curatorial Practice Workshop will be led by Fatos Ustek, fig-2 Curator, and bring together a range of arts and museum professionals to contemplate the future of curating and public collections. Fig-2 closed in December 2015. This workshop will take place outside of the fig-2 premises, within the space of a public institution and respond to both its locality and its context. The first three workshops explored various positions in curating at public institutions, the impact of museums and cultural institutions on importing historical consciousness and shaping of personal identity, and concentrated on the future of art’s visibility. In a cumulative manner, the series concentrates on the relationship between the artwork, the exhibition and the audience. The fourth and final workshop will draw on influences from fig-2 as a showcase for dynamic curating, bridging disciplines and time-lines, and responding to the currencies of aesthetic and critical engagement. The workshop will be a moment of pause and reaction, offering insights to the various models of trans-historical curating taking place in art institutions world-wide, today. 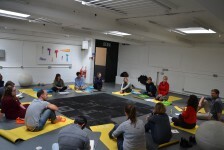 24 September 2015 13:00 – 17:30 Exploring different positions in curating and running art institutions.